The dramatic, and seemingly unstoppable, surge of Taliban offensives across Afghanistan is proof that the US is fast becoming the latest foreign power to succumb to failure in a land known for being the “graveyard of empires”. But unlike past empires defeated in Afghanistan, the US stands out as singularly contributing to its own ill-fate through excessive blundering and its legacy of criminal duplicity. In particular, Washington’s obsession with confronting neighboring Iran and plotting regime change in Tehran could well be the tipping point in Afghanistan. The point, that is, where the US tips itself into a strategic, military grave it has been digging in Afghanistan over the past two decades. After 17 years of US military occupation costing the US taxpayer trillions of dollars, the Taliban insurgents seem to be able to launch spectacular attacks at will against the Washington-backed government in Kabul. By any measure, that portends a historic defeat for Washington’s imperial ambitions. And not just in Afghanistan. Over the past week, a strategic city, Ghazni, only 150 kms south from the capital was under Taliban occupation for several days before the militants appeared to make a tactical retreat to surrounding areas. Then in the capital, Kabul, on Thursday, the Taliban mounted a gun battle on a military-intelligence training base, as if to underline the ineffectualness of US-backed security forces. A military intelligence base caught in a surprise attack? Further north, in Faryab province, an Afghan National Army base was reportedly over-run by militants with the apparent loss of 30 troops and the remaining 70 captured. Provincial elders said the base was easily captured by the Taliban because it lacked reinforcements, ammunition and food. So much for US support. Recall that Afghanistan was supposed to be the “Soviet Union’s Vietnam”. That was how US planners like Zbigniew Brzezinski gleefully referred to Afghanistan and their nefarious scheme to inflict on the Soviets what the US had ignominiously suffered in Vietnam only a few years earlier. In 1979, Soviet troops were lured into the Central Asian country to prop up an allied government in Kabul coming under attack from US-backed tribal fighters, the Mujahideen. Like British imperial troops a century before, the Soviets suffered defeat in the rugged mountains of Afghanistan at the hands of fearless fighters. Of course, the Soviets were not just up against Afghans. The CIA had weaponized the Mujahideen with Stinger anti-aircraft missiles and other sophisticated munitions. Along with Britain’s MI6, the Saudis and Pakistani military intelligence, the Afghan insurgents were turned into a jihadist army which later evolved into the Al Qaeda terror network. The irony is, however, that the “Soviet Vietnam” has now turned into another US quagmire – an American Vietnam redux. Following the September 11 terror attacks in 2001 on New York City and Washington DC, the George W Bush administration rushed into Afghanistan in an act of revenge against Al Qaeda – the very organization that the Americans had earlier helped create. Nearly 17 years later, the US military is still bogged down in Afghanistan with no viable exit plan in sight. The war is officially America’s longest war, surpassing the duration of the Vietnam War (1964-75). 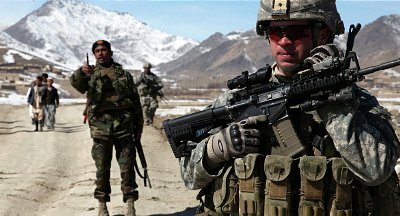 Although US casualties are much less than was incurred in Southeast Asia, the financial cost of Afghanistan to the US economy is crippling, estimated to be up to $5 trillion, along with the Iraq war. That’s a quarter of the US total national debt of $21 trillion. US military operations were officially supposed to end in 2014 during the Obama administration. When Donald Trump ran for the presidency in 2016, one of his winning pledges to voters was to scale back US wars. Last year, however, Trump acceded to Pentagon advice to revamp military involvement in Afghanistan, albeit under the guise of “training and support” for local forces. As this past week’s audacious attacks by the Taliban demonstrates, the US-backed government forces are fighting a losing war. Vast areas of the country are outside of their control. Even the capital appears vulnerable to heavily-mounted raids. Moreover, the situation can only get worse for the US and its Afghan surrogates. What may be a decisive factor is the Trump administration’s criminal policy of aggression towards neighboring Iran. In myopic fashion, Washington’s desire to squeeze Iran with “crushing” economic sanctions is liable to rebound, by significantly worsening the security conditions in Afghanistan for US-backed forces. That’s because as the US imposes tougher sanctions on Iran, following Trump’s abandonment of the international nuclear treaty in May this year, the deteriorating Iranian economy will have a direct deleterious impact on Afghanistan. Thousands of migrant Afghan workers rely on Iran for employment. Their salary remittances are reportedly a major lifeline for families back in Afghanistan. With the Iranian economy already faltering under US sanctions, droves of unemployed expatriate Afghan workers can be expected to pack up and leave, cutting off the remittances that sustain much of Afghanistan’s economy. A further impact from Washington’s sanctions on Iran is that landlocked Afghanistan will not be able to avail of Iranian seaports for imports and exports. Trump is threatening secondary sanctions on any country continuing to do business with Iran. Unless the US gives Afghanistan a waiver, it will be cut off from commercial ties with Iran and its trading routes to the Indian Ocean. So, as the US-imposed economic pressure on Iran intensifies through ratcheting up of sanctions – Washington wants a total oil embargo by November – the inevitable result will be worsening social conditions in Afghanistan for the general population there. That lamentable outcome, it is reasonable to assume, will only boost popular support for the Taliban, making the US-backed Afghan forces even more insecure and ineffectual in their operations. A third factor is that Iran could exercise a more malicious option by increasing military support covertly to the Taliban. Iran is reckoned to have developed a formidable arsenal of advanced missile technology. This week, for example, Tehran showcased a new radar-evading ballistic missile. Given that the Americans are trying to destroy the Iranian government through vicious economic measures, it would not be at all surprising if Tehran fought back by supplying the Taliban fighters with devastating firepower to hit US forces. Thus, by running a sanctions vendetta against Iran in the calculation that the economic pain might elicit social unrest and regime change, Washington is likely to end up inflicting serious blowback on its military campaign in Afghanistan. America’s longest overseas war could turn out to be its most ignominious and wasteful. That’s saying something given the dozens of dirty wars that the US has engaged in over the past century. The repercussions for US global standing cannot be underestimated. It not only ran a nearly two-decade war in Afghanistan, which was arguably illegal from the very outset, resulted in tens of thousands of casualties and was financially ruinous for the US economy, but the supposed almighty US power will have been defeated in the graveyard of empires largely by its own criminality, stupidity and arrogance.